1. Make sure that you are working in the KDE environment and that at least one browser is installed into the system. (I don't know if the bug can be reproduced if both the KDE and GNOME environments are installed, but it definitely is reproducible if only the KDE system is present). 2. Open Thunderbird. If you are starting with a fresh profile, ignore the request to set up a new account by closing the window. 3. Open the Preferences dialog (Edit->Preferences), switch to the Attachments tab and make sure that no application is listed for HTTP links. Close the dialog. 4. Open an e-mail message containing an HTTP link (go to File->Open->Saved Message and choose a saved e-mail message or, if a message containing a link is present in the Inbox, use that as well). For the testers' convenience, I have attached one to this report (see ). If you are prompted to create a new account (as no one exists), skip it. The "Choose application" window appears, presenting a list of installed browsers or offering to open the link with the default browser. The "Choose application" window appears, offering only the choice to select an application's binary file (see attached screenshot, ). No installed browsers are listed nor is the default browser offered as a choice. This kind of support is already offered by Thunderbird in GNOME (through the thunderbird-gnome-support package). I have reproduced the issue on a clean Thunderbird profile, with the English Language Pack and the Addon Compatibility Reporter, Lightning and Enigmail extensions installed. When I click on the links the website does not open, but there is a window, where I can choose the browser. But there a no browsers shown at all, so I cannot really chose one. I installed firefox and rekonq is already installed. But it does not work anyway or at least shows the browsers to choose. In the window where you can choose the browser, have you tried clicking on the "Choose" button and then choosing the executable file for your browser (like "/usr/bin/firefox" if you want the link to be opened with Firefox)? I have searched the Launchpad bug tracker, seems that the list has already been implemented in GNOME (package thunderbird-gnome-support) but not in KDE. I have changed the title and description of this bug report so that it matches the format used by the Ubuntu Mozilla team, as well as confirming the bug (I have reproduced it myself and am attaching a test case below). Simple e-mail containing a link. May be used in the test case contained in the bug description. 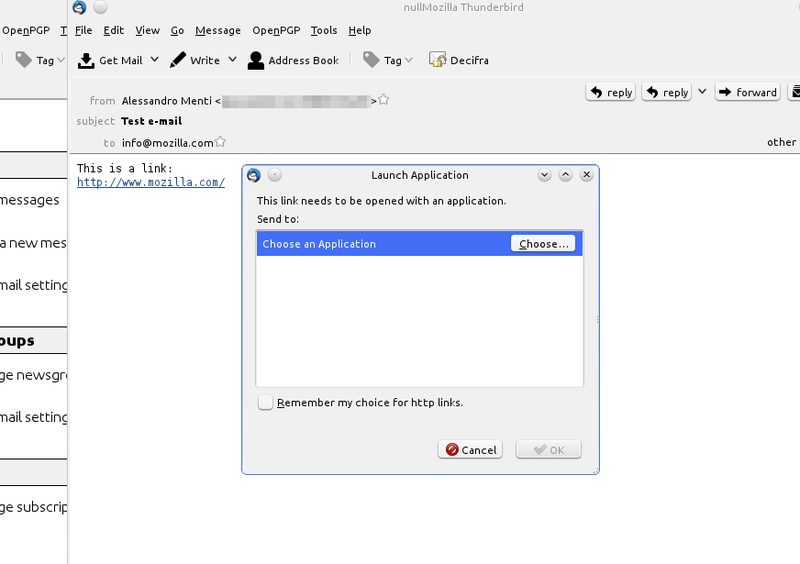 Screenshot of the "Choose Application" window. No browsers are listed even though two of them (rekonq and Firefox) are installed. Wishlist suggested by Elgaton; seems reasonable.